The KittenCam is still up and running – it’s over to the right. 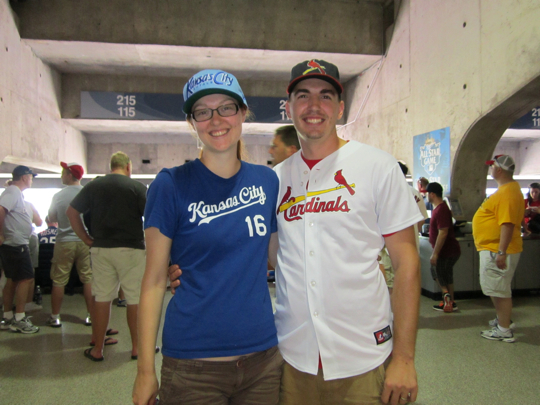 Here’s today’s top story: After running wire on Saturday we drove to Kansas City for a Royals vs. Cardinals game on Sunday. 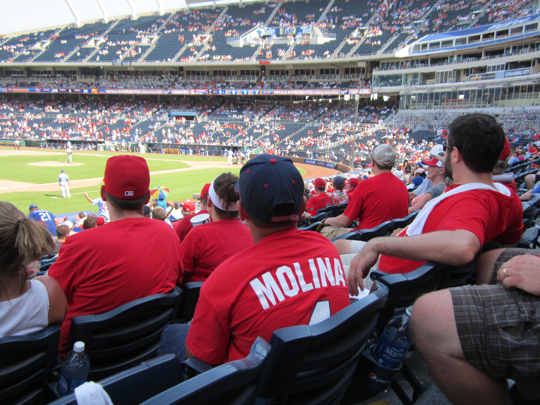 We met up with the Kolliparas and Lloyd’s parents – all big Cardinals fans. I don’t know how Lloyd and his folks and Steph survived sitting in the sun for the whole game. I gave up after two innings and wandered around in the shaded part of the stadium, waiting for my soaked clothes to slowly dry off. I even bumped into an old CDC co-worker. He and his wife have a mixed marriage. To make this more real for you, let’s have a sing-along. Cue the organ music. Take me out to the blaze. When people are passing out against the walls? I think that I have ‘steamed buns’. And 1-10 in the sun. I like people-watching at sporting events like that. 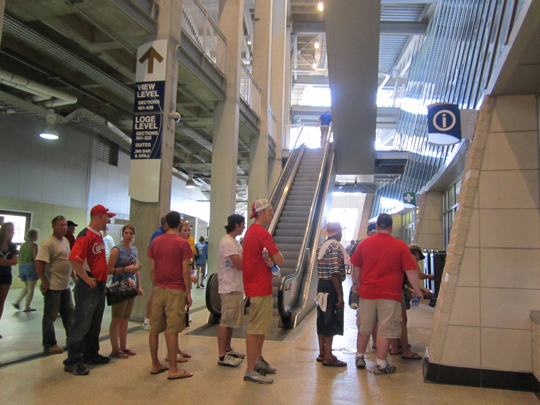 Being in the shady undercroft of the stadium would be a fun place to do that. Ahhhh…..that weather is on its way here! Estimated arrival: Tomorrow. I think I might crawl in a dirt hole until it’s all over. I hope you are safe and out of harms way. We enjoyed our day at the ball game. Thank you for sharing your weekend. It was hot but a great game to watch. It was 111 when I left work today. The forecast was for 108. Tomorrow a little cooler, just 106. It’s like Phoenix, but with humidity.